Already, or constantly, thinking about "next year?" Programming your show can sometimes be a daunting task. The process is your key and here is one method to prepare your program for success. The Napkin: Staying ahead of the curve is essential. In many instances, directors and design staff will have the Idea Engine running full tilt constantly. Keep an open mind and be receptive to your surroundings and everyday life. You never know when that elusive idea is going to flip your internal switch. 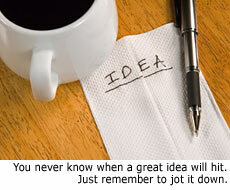 When it does and the bells and whistles go off, jot it down on anything, even a napkin. As you build your own catalog of epiphanies, be mindful of your program's limitations, capabilities, and potential. There is nothing wrong with shelving an idea until your program provides a symbiotic opportunity. If your program severely overreaches its grasp, the end result will most likely leave you with unhappy students, discouraged parents, a frustrated staff, and a great idea that simply did not come to fruition. All out of ideas? Never be afraid to ask for help. Staff Mealings: Communication between the director, designers, and staff is essential, especially in the planning stages. Schedule a design meeting around a meal. Whether you are grilling at your house or reserving a few tables at the local wings authority, food will create a relaxed social atmosphere and get the creative juices flowing. Ownership and "buy in" to the idea is crucial and essential for all members of staff, top to bottom. Everyone involved in the planning process should have an opportunity to give and receive feedback, present their own ideas, as well as modifications to others, and remember to be objective. Most of the concepts brought to the table will be the vested interests of someone and should not be callously thrown under the bus. Make every attempt to establish and maintain a fluid organic process. 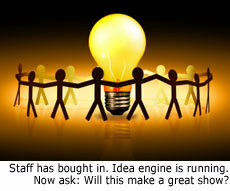 The Idea Engine: Your concept will usually begin with a theme. For example, you might want to base your show around the color blue. Your next decision will be either visual or musical. In most instances, it will not matter which emerges first, for one leads to the other, leaving it a circumstance of choice. From the visual perspective, you might choose to center the show around elements involving the sky and or water ... this will then lead you to your musical counterpart. If you approach the musical avenues first, you might decide to employ the blues and a little jazz ... this will then create the visual persona you seek. The idea engine is limitless and always in production. The question and challenge emerges as simply, "Will this make a great show?" Pacing. Your two most important factors inherent in pacing are the length and undulations of your show. In length, you will need to find a balance between the stamina of your ensemble and the phraseology which best serves the written program. The undulations of your work (peaks and valleys) must provide tension and release, both musically and visually, to create the emotional response you desire from your audience. Effects. The pivotal ingredient that separates the shows of legend from the rest of the field is effect. Coupled with pacing, you should plan your effects moment to moment. It is important to remember that the entire program cannot be "the effect" simply because there will be nothing available for contrast. Your effects must be well orchestrated and achievable to reach your audience and convey your ideas fluently. These are your peaks. As you move through your valleys, remember to consider your transitions. Transitions. The most important and sometimes most overlooked elements of your show are the transitions. As you plan your effects, how you get in and out of them is just as, if not more important than, the effect itself. The downfall of any designed program, visually or musically, can be hearing the word "functional" applied to your transitions. The solution is held in motivation, purpose, and direction. Your transitions must provide the audience with a sense of perpetual motion as they ride along in the vehicle you have created. Strengths. You are your program's harshest critic and greatest fan. No one knows your ensemble better than you and this knowledge should be used to your advantage. As you opt through the show ideas from season to season, choose and plan the show to harness your program's strengths. For example, if you just graduated every horse you have in the brass section, don't choose a big band show for the fall. One misconception that many directors and staff hold on to is the need to hide your weaknesses. In contrast, your approach through planning and programming should simply be not to expose them. Use them as the thread and not the needle. 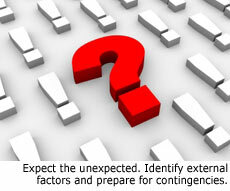 Contingencies: It is difficult to plan for the unexpected, but here are a few factors to consider. • As you design and program your show, you will no doubt want it to be a challenging effort for your students. However, take moment to ask yourself if they can truly pull it off. • Try to identify and prepare for your externalities. A few for example: Parent involvement (How much and how many?). Props (Are they essential ... are they worth it?). Equipment (Do you require additional vehicles for transportation? Do you need materials fabricated for the color guard or set design?). Rehearsal Time and Space (Will your concept require more or less of either?). • Deception and Reception. It is quite easy (and most times comforting) to get lost within your own ingenuity, but do not be deceived. Consider your idea and its reception by the band itself, the student body and "football crowd," as well as your competitive audience ... balance can be found and achieved. Do not blindly assume that your response will be the adopted opinion of others. That having been said, your program does not necessarily have to be "user friendly." An avant-garde production could be what everyone has been secretly craving. Remember that one of your greatest allies is time. Once you have chosen your road, give your idea a little time to breathe and grow. Revisiting with fresh awareness and hunger will only provide a catalyst to fuel your Idea Engine again and again. Bobby Hullett is the Founder and Director of Innovation of Sounding Ground. He is also the author of Ethics Everyday (EthicsEveryday.com). Bobby has earned a Master's Degree in Education as well as a BBA. His work with renowned educators at all levels of the pageantry arts includes DCI, WGI, BOA, as well as many local associations around the nation. A complete listing of history and experience can be found on his website, SoundingGround.com. Sounding Ground offers visual design and musical arrangements and compositions, in addition to many other services. Text courtesy of Bobby Hullet. Images licensed through iStockPhoto.